You all know how I love to find photos of rooms by designers before and after the magazine stylists get their hands on them. 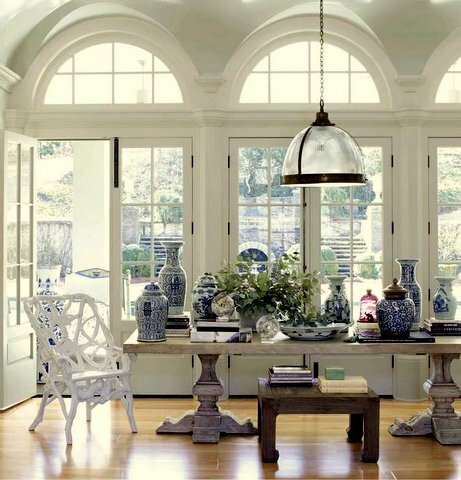 This is in the living room of an Atlanta home by interior designer Beth Webb in the current issue of House Beautiful. An interesting side note. There is no dining room. People eat in the kitchen or at this plank table in the living room. 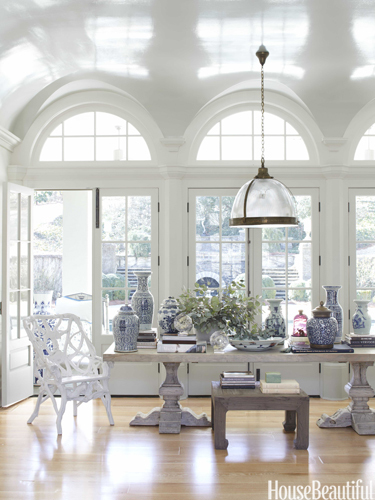 At any rate, quite a difference here - the before picture is so terribly cold and Restoration Hardware like and the after picture is so fabulous switching out that dull wing chair and nondescript tablescape with books and all that wonderful blue and white Chinese porcelain. Oh the restorative powers of Chinoiserie! Styling is MAGIC!!! A great stylist is worth his or her weight in gold! And I am convinced one must be born with an innate ability. "Learning" how it is done never seems to produce the same breathtaking result as that God-given talent. I wish they left the dog in the picture. Those high gloss ceilings are stunning. Gosh, I totally agree. No comparison.